I've expanded on the original post, so here are some quick reference links to anyone new passing through. There's a lot of text at this point, so I recommend just clicking through some of the sample images for the various designs linked below to get started. 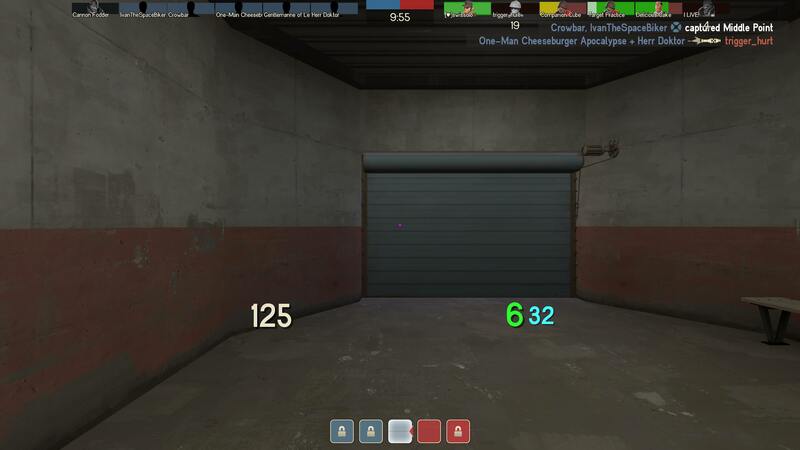 I created a modified match hud (the player info section listed at the top of the screen) that presents information in a much more useful way than the default. To be very clear, this isn't an entirely standalone hud. This is just a modification that you can append to your existing custom huds. I mostly focused on formatting for competitive play so it gets a bit cluttered (names especially) with 24 players, but I think it's still quite usable in that form. This takes some minor hud editing knowledge but it's a pretty simple process overall. 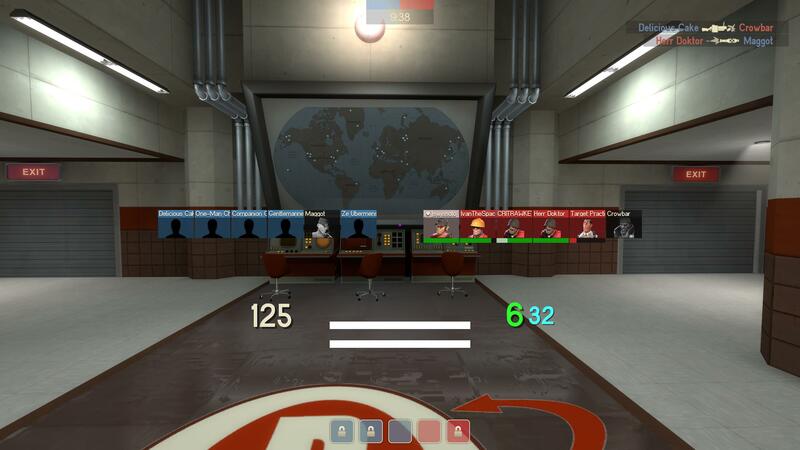 In short, just add the match hud source then add fonts. This section is only lengthy in an effort to make it as clear as possible. Do not overwrite entire files. Each pastebin source should be pasted inside of existing files as shown below. Paste this in your hudmatchstatus.res file. Paste this in clientscheme.res (or wherever your hud defines your fonts, potentially in something like resource/scheme/fonts_clientscheme.res). Add this file in your resource -> fonts directory. You may need to move your kill feed down in hudlayout.res. Look for HudDeathNotice -> ypos. I opted to just let my respawn timers sit on top of the kill feed but that's easily changed. I've only tested on 2560x1440 so I'm not quite sure how this will look at other resolutions. 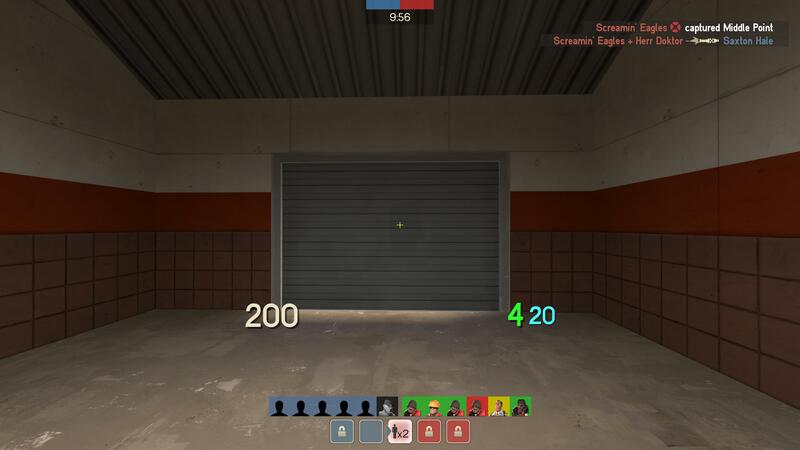 If you want modify the match hud yourself, you'll want to watch out for the following. Beware that hud_reloadscheme alone isn't enough to see your updated changes for any parameters within playerpanels_kv. Your changes need to trigger a refresh of the entire field as well. Perhaps there's a better way of doing this, but I settled on modifying TeamStatus -> max_size along with my changes inside playerpanels_kv then calling hud_reloadscheme each time. 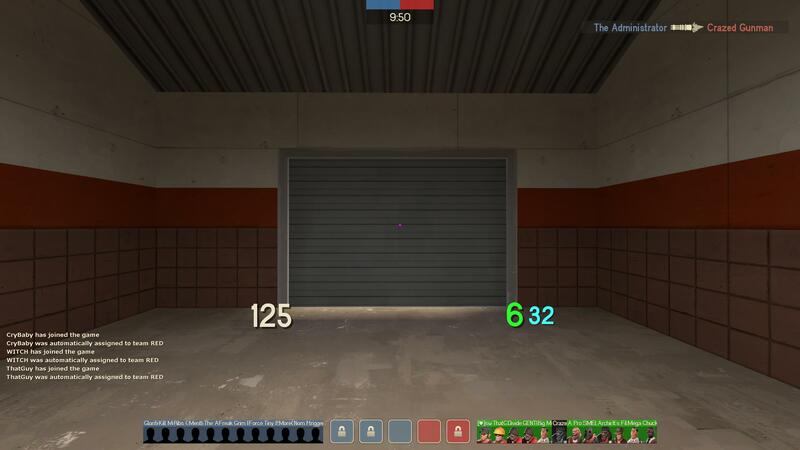 The max_size change seems to be enough for the match hud to be reevaluated. Note that I believe max_size only has an effect on teams with 6 players or fewer. If you have 7 or more players on your team, team1_max_expand and team2_max_expand are used. Thus, if you're using this trick, make sure you have 6 or fewer players on your team or your changes won't appear. Lots of parameters and features are broken as far as I can tell because Valve didn't bother to finish implementing what they weren't using. Every block below respawntime in my file is disabled. The death and skull panels work, but I couldn't get anything useful out of the other disabled sections (which includes chargeamount sadly). Let me know if you get one of these features working. The background underneath your own player indicator seems to be forced to a brighter color and can't be modified. Player indicators are only expandable horizontally as far as I can tell so I don't believe you would be able to put them on the sides of your screen stacked vertically. Some design factors you might want to keep in mind. I think I managed a pretty good balance here, but me know if you have any suggestions! I'd love to see what others can accomplish. [*] You may need to move your kill feed down in hudlayout.res. Look for HudDeathNotice -> ypos. I opted to just let my respawn timers sit on top of the kill feed but that's easily changed. [*] I've only tested on 2560x1440 so I'm not quite sure how this will look at other resolutions. [*] Beware that hud_reloadscheme alone isn't enough to see your updated changes for any parameters within playerpanels_kv. Your changes need to trigger a refresh of the entire field as well. Perhaps there's a better way of doing this, but I settled on modifying TeamStatus -> max_size along with my changes inside playerpanels_kv then calling hud_reloadscheme each time. 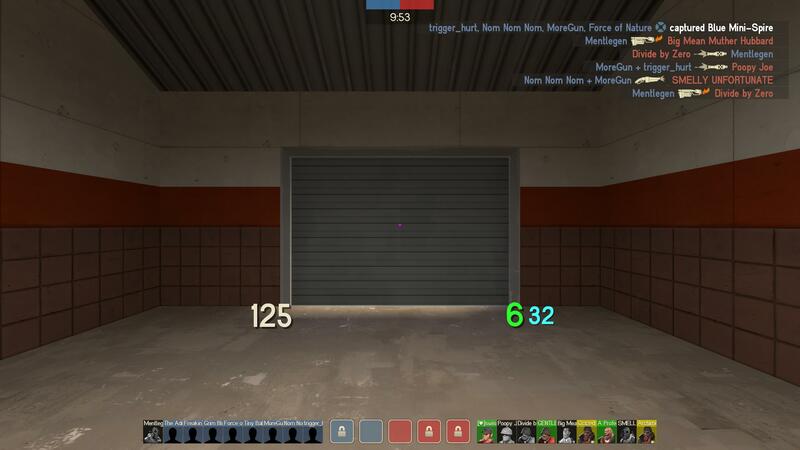 The max_size change seems to be enough for the match hud to be reevaluated. Note that I believe max_size only has an effect on teams with 6 players or fewer. If you have 7 or more players on your team, team1_max_expand and team2_max_expand are used. Thus, if you're using this trick, make sure you have 6 or fewer players on your team or your changes won't appear. [*] Lots of parameters and features are broken as far as I can tell because Valve didn't bother to finish implementing what they weren't using. Every block below respawntime in my file is disabled. The death and skull panels work, but I couldn't get anything useful out of the other disabled sections (which includes chargeamount sadly). Let me know if you get one of these features working. [*] The background underneath your own player indicator seems to be forced to a brighter color and can't be modified. [*] Player indicators are only expandable horizontally as far as I can tell so I don't believe you would be able to put them on the sides of your screen stacked vertically. I edited some RGB values and health %s so it makes more sense to me at a glance (here), but I'll give someone a cookie if they can make it so a buff fills the entire bar, not just stopping halfway through. I edited some RGB values and health %s so it makes more sense to me at a glance ([url=https://pastebin.com/YdwZJvLr]here[/url]), but I'll give someone a cookie if they can make it so a buff fills the entire bar, not just stopping halfway through. PeteI edited some RGB values and health %s so it makes more sense to me at a glance (here), but I'll give someone a cookie if they can make it so a buff fills the entire bar, not just stopping halfway through. 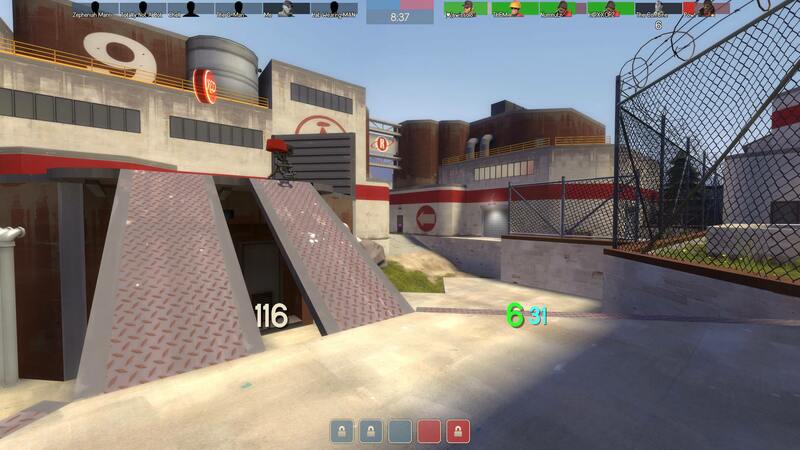 As far as I know the only way is to set the overhealbar "wide" parameter to double your "max_size" in TeamStatus. That will only work up to 12 players and break at 13+ since the match hud switches scaling modes to using "team1/2_max_expand." I think you already figured that out? I was in your stream for a minute a couple days ago and it looked like it haha. But hey in case someone else wanted to know it's a half solution. You might be able to get rid of all width scaling everywhere, use all fixed values, and just live with weird spacing for 13+ players, but I doubt that sacrifice would be worth it. Anyways, I'm going to post another little experiment here tomorrow. Should be pretty interesting. [quote=Pete]I edited some RGB values and health %s so it makes more sense to me at a glance (here), but I'll give someone a cookie if they can make it so a buff fills the entire bar, not just stopping halfway through. 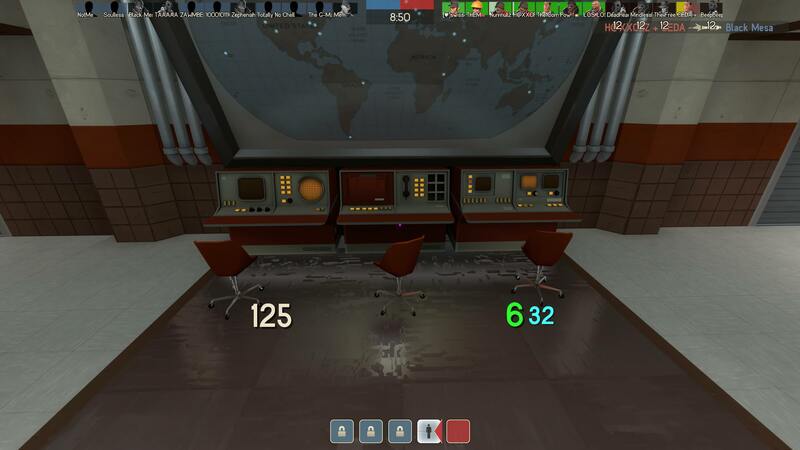 As far as I know the only way is to set the overhealbar "wide" parameter to double your "max_size" in TeamStatus. 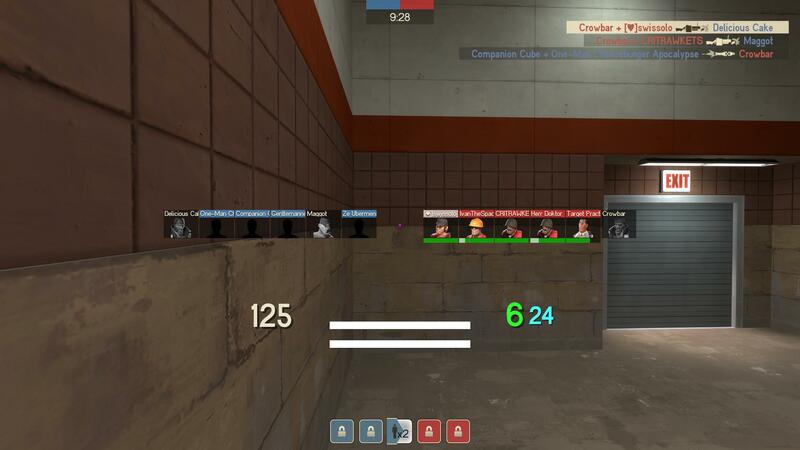 That will only work up to 12 players and break at 13+ since the match hud switches scaling modes to using "team1/2_max_expand." I think you already figured that out? I was in your stream for a minute a couple days ago and it looked like it haha. But hey in case someone else wanted to know it's a half solution. You [i]might[/i] be able to get rid of all width scaling everywhere, use all fixed values, and just live with weird spacing for 13+ players, but I doubt that sacrifice would be worth it. 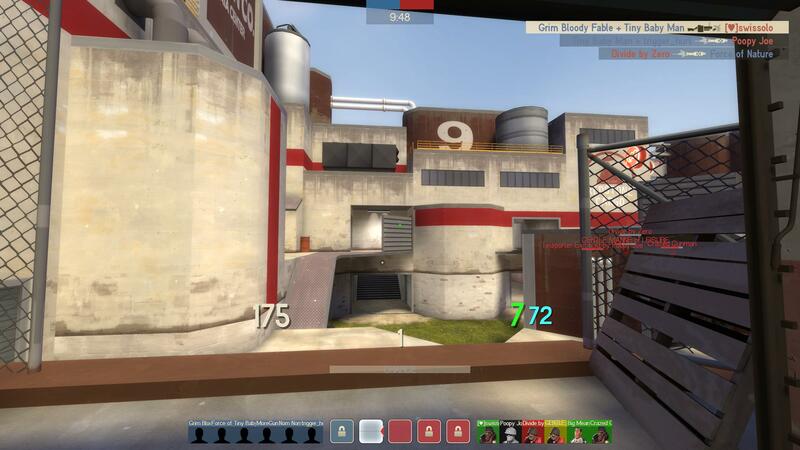 I made a toggleable, centered match hud this time. It behaves just like the scoreboard would. I noticed using the top bar was very out of the way for me, but enlarging the elements or moving them encroached on screen space I don't want wasted most of the time. Sooo I decided to try this out. I know a lot of players can't break the habit of opening their scoreboard, so this works as a replacement. 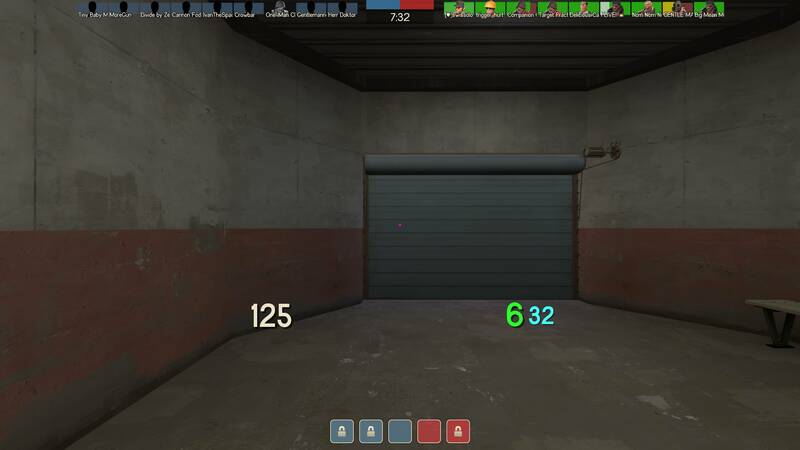 Move your scoreboard key to somewhere else and use the script down below to toggle the match hud instead. There's one glaring issue with this approach. Toggling tf_use_match_hud seems to cause the game to stutter. If you have 12 or fewer players on the server, it's barely noticeable (at least on my machine. I have to spam the toggle to see it). I'm pretty sure this approach is still usable for 6s, but it's an irritating downside. You'd have to decide for yourself. Once you get into larger player counts the stutter makes it completely unusable. This was kind of a failed experiment. The specially colored elements (team colored panels and health colors) flash briefly on load as well, but it's fairly minor. I tried to hide the flashing effect the best I could with good default colors. Respawn numbers had been working for days flawlessly with this design and suddenly broke today at random without having been modified. If you try this out let me know if you can see them. Anyways, I figured I'd share this despite the issues for interests sake and in case anyone doesn't mind/notice the 6s stutter. Refer to the first post for instructions. It's the same process plus the toggle script. Toggle Script Add this to your autoexec.cfg. [*] [url=https://pastebin.com/raw/6DFQaVbQ]Toggle Script[/url] Add this to your autoexec.cfg. I just keep on making these. This one explains itself really. I stripped away a bunch of the information so it would be easier to take in at a glance and to fit it in a (potentially) more useful position. Refer to the first post for instructions. This one is really easy since there are no fonts to worry about. You still need the rest of the code in there. You only need to replace a certain part in it. Ctrl + f and look for "TeamStatus" and replace that part of the code block with the one he listed. Here's a different take on the last concept. For some reason no matter what I do, regardless of the design and number of times I reboot the game, my respawn timers won't show up. I would have preferred to include them but there's no way for me to position them properly without seeing them. Let's just pretend it was a design choice to keep things minimal haha. At this point this is probably my favorite design and the one I'll be sticking with. The paragraph below (in spoiler) is a lengthy explanation justifying the design. Skip it if you don't care haha. Way too much thought has gone into this for what it's worth. Anyways, I'm pretty happy with the colored tile approach over displaying health bars. I think it's the best feature here. At a glance, it conveys the information I want much more clearly. There are only 2 or 4 color states depending on which team you're looking at (your own team or the opponent). It makes it easy to roughly evaluate total team health and count numbers. Low health stands out very clearly. When health gets low using health bars, the bars shrink and minimize the information you really want highlighted. I believe it's easier to process the trends for entire groups using color over area/length here, at least when the bars don't extend from the same 0 point. Using tiles instead of bars also removes the need to have every entry so wide. Originally, I thought it would be important to be able to display most of the characters in names of reasonable length. I find I don't really care. Usually, the first few characters are enough to be able to differentiate which player is which. Players could add long prefixes to their names to cause problems, but they could always make their names ridiculously similar so you can't tell them apart on the scoreboard anyways. Maaaaybe ESEA tags could cause problems. If you need to, just widen the tiles slightly. I started making more designs because I found using the top of the screen uncomfortable. It's out of the way and, given the width of the original design, it could be a bit much to parse. I'm not entirely sure about the current positioning on the screen. I might move it back up on top of the cap indicators like the minimal 1 design. It's preferable to have the blu and red match hud sections next to each other to easily compare, but the raised position felt intrusive so I moved it down to the base of the screen. I may have just had to get used to it or maybe it did unreasonably obstruct the view. It's up to you really. The travel distance from other useful parts of the screen (ex health/ammo) is still much better on the very bottom condensed compared to the top so it seemed like an acceptable compromise. I found merging all of the tiles together with no gaps was just easier on the eyes. That will probably also be up to personal preference. Here are some tips for adjusting the things I just discussed if you want to tweak the design. Adjust 1-6 players tile width: "TeamStatus" -> "max_size"
Adjust 6+ players tile width: "TeamStatus" -> "team1_max_expand" and "TeamStatus" -> "team2_max_expand"
Re-add tile gaps: "TeamStatus" -> "6v6_gap" "1" and "12v12_gap" "1"
Refer to the first post for instructions. [spoiler]Anyways, I'm pretty happy with the colored tile approach over displaying health bars. I think it's the best feature here. At a glance, it conveys the information I want much more clearly. There are only 2 or 4 color states depending on which team you're looking at (your own team or the opponent). It makes it easy to roughly evaluate total team health and count numbers. Low health stands out very clearly. When health gets low using health bars, the bars shrink and minimize the information you really want highlighted. I believe it's easier to process the trends for entire groups using color over area/length here, at least when the bars don't extend from the same 0 point. Using tiles instead of bars also removes the need to have every entry so wide. Originally, I thought it would be important to be able to display most of the characters in names of reasonable length. I find I don't really care. Usually, the first few characters are enough to be able to differentiate which player is which. Players could add long prefixes to their names to cause problems, but they could always make their names ridiculously similar so you can't tell them apart on the scoreboard anyways. Maaaaybe ESEA tags could cause problems. If you need to, just widen the tiles slightly. I started making more designs because I found using the top of the screen uncomfortable. It's out of the way and, given the width of the original design, it could be a bit much to parse. I'm not entirely sure about the current positioning on the screen. I might move it back up on top of the cap indicators like the minimal 1 design. It's preferable to have the blu and red match hud sections next to each other to easily compare, but the raised position felt intrusive so I moved it down to the base of the screen. I may have just had to get used to it or maybe it did unreasonably obstruct the view. It's up to you really. The travel distance from other useful parts of the screen (ex health/ammo) is still much better on the very bottom condensed compared to the top so it seemed like an acceptable compromise. I found merging all of the tiles together with no gaps was just easier on the eyes. That will probably also be up to personal preference. Here are some tips for adjusting the things I just discussed if you want to tweak the design. [*] Adjust 1-6 players tile width: "TeamStatus" -> "max_size"
[*] Adjust 6+ players tile width: "TeamStatus" -> "team1_max_expand" and "TeamStatus" -> "team2_max_expand"
[*] Re-add tile gaps: "TeamStatus" -> "6v6_gap" "1" and "12v12_gap" "1"
Was everyone able to get the other designs working? The only issue I've heard of people running into so far was just from accidentally overwriting entire files instead of subsections of the files. I'll edit the original post to make is super clear. Let me know if something else is up.